A major solar eclipse will sweep across the United States this year, but if you don't live near the path of totality you're running out of time to book hotel rooms and flights. Reports on social media indicate that some of the best locations, such as Oregon, are just about impossible to book for the Aug. 21 event. So perhaps you're too late for this year. But don't despair, Tyler Nordgren told Seeker. If you can wait seven years, there's another chance to catch a total solar eclipse from the continental United States. This one will go in a very different direction, though. While 2017's eclipse will move across states between Oregon and North Carolina, the 2024 eclipse will move from Mexico, across Texas, and then sweeping through parts of Oklahoma, Arkansas, Missouri, Kentucky, Mississippi, Missouri, Illinois, Indiana, Ohio, Pennsylvania, New York State, Virginia and Maine. Parts of Canada will also see the full eclipse. 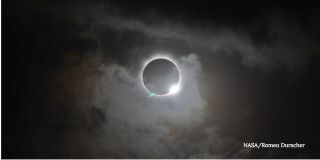 "All the excitement of 2017 will, I believe, make everyone say 2024 — I cannot miss 2024," said Nordgren, an astronomer at the University of Redlands, Calif., who has seen five solar eclipses and plans to catch the 2017 one in Oregon. "So if you miss 2017, the excitement will make you see it in 2024." If the weather holds out — bearing in mind that upper New York State is iffy in April — one of the most spectacular spots to catch the eclipse could be right at Niagara Falls, Nordgren said. Canadians would also be able to see the eclipse from their side of the border, providing some potentially amazing views as the shadow passes across the three waterfalls on both sides of the border. Large cities getting a prime view include San Antonio, Austin, Dallas, Indianapolis, Cleveland, Buffalo, Rochester, and Montreal (in Canada). Several other large cities are within an easy drive of the eclipse, such as Houston, Oklahoma City, St. Louis, Cinncinnati, Columbus, Detroit, and Canada's Toronto and Ottawa. But Nordgren urges people, if you can, to go see the 2017 eclipse as well. Every person in the United States will have at least a partial view of the eclipse, so it's an opportunity to experience something together. "I suspect this is going to be the greatest shared experience that this generation is ever going to have," Nordgren said. "Unlike other shared experiences, maybe we have to go all the way back to the moon landing [in 1969], this will be a joyful shared experience." WATCH VIDEO: Why Does The Sun Always Look So Cool?